I approached the business owner, or manager, and asked if I could remove the flag to properly honor it by retiring the flag. The man I talked to was hesitant, so I went to my truck and gave him a $30.00 Rainbow wind sock, he then agreed to let me have the flag. I removed it, took it to Port Isabel and handed it over to an American legion post. They assured me that the flag would be properly retired. Sorry, Susie-Q, I didn't know where to find a Scout's location. I barely knew where the Legion was. I am Stupefied, as Dr. Phil would say, as to why the thousands of people passing that flag would not take action, that doesn't speak very well of us as Americans, does it? Pretty damn sad when you think about it. Those Legion members should be looking for things like that, instead of sitting on their A#*#$ drinking beer all day. The old f_____s sitting on their butts all day was precisely the reason I quit VFW and the Legion both. They of all people should be willing to honor our flag at all times. My father taught me that living under our flag was an honor and a privlige that had to be earned. I have always tried to live up to that. Thank you, Jim, for doing that. And thank you to the American Legion for taking the torn flag. Not all American Legion and VFW members sit on their butts all day drinking beer. Too bad a few ruin the impression for those that don't. You are right, it does not speak well of us as Americans. And, from what I read in our lousy paper, and what little I can stomach on national television, it's going to get lots worse before it gets better. I for one, do not understand the rampart anti Americanism that is everywhere, from the sorry media to the idiots in Hollywood. Where are the good guys in Hollywood...like PFC Lee Marvin, USMC...he's probably rolling over in his grave in Arlington National Cemetary. It is not a bad thing to honor our flag and our country. No one will make fun of us for that. If they do, shame on them. Thank you! Not many people would do what you did...I salute you! Thank you Steve, you would have. I think anyone who responded to this thread would have. Thank you Ozz. Waaaaay to many people take for granted what the flag means. A lot of men and wemen have made sacrifices for us to be free. And too many do not understand the importance of freedom. and that freedom is a responsibility. And waaay too many people are too quick to give up their rights for convienance. And honoring the flag is such a small task! Thank you Ozz for doing that! As Cat320 says, there is so much being said against us as Americans. The Anti-American movement seems to get worse as time goes by. My question would be, If this isn't the greatest country to live in, then why do so many risk their lives just to come here? We should all be proud to be Americans. Well done Ozz! You WERE the calmer voice and handled the situation in an honorable manner - as opposed to your initial reaction, which I certainly don't blame you for. As a veteran of almost 25 years in the U.S. Navy (retired 3/1/91) and a recently retired school teacher (2/1/07 after 11.5 years), I can tell you that this anti-American flag attitude is alive and well in our public school children. We started each day with the pledge and it never ceased to amaze me how many kids would not stand or would stand with their hands in their pockets, etc. It made my blood boil!!! Unfortunately, there was little a teacher could do other than explain the finer points of flag etiquette and make it very clear how I felt about their attitude. Generally, that did improve thing some. Anyway, sorry about jumping up on my "soapbox". Great job Ozz: just knew that you would take care of matters and would not let it past. it was a great post and I truly believe it woke us all up to the disrespect of our great flag. 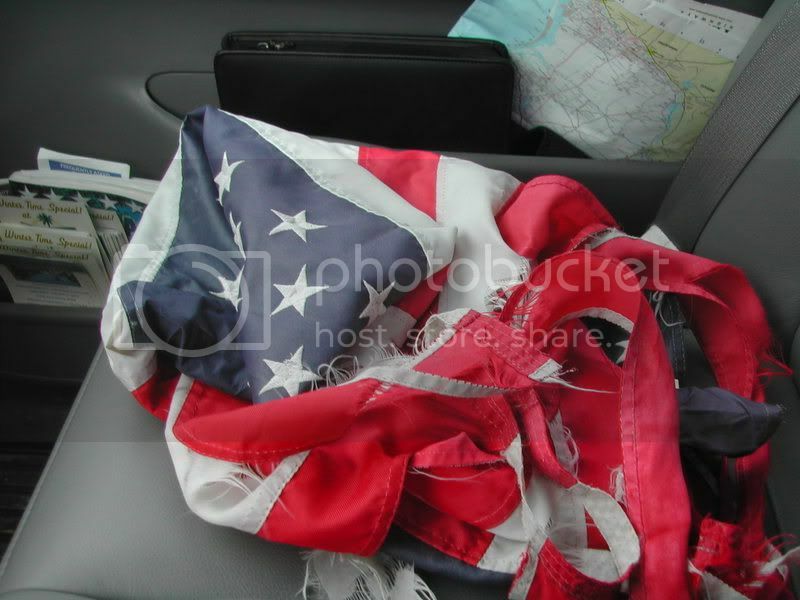 I'm positive that all of us will think a little different when we see flags battered and torn and in need of replacement. Hopefully we will follow your foot steps and take proper action, I know I will. Having retired from service in school districts (25 yrs), I know what you mean. I worked with one principal who visited a different classroom each morning. If a student didn't participate in the pledge, he would politely ask them to explain their position. After the first few months of school, 99% of the students participated. Most students really didn't have a reason not to participate. I fly the American and POW flag on the front of my RV lighted 24/7 for 3 years now, Mine were no where near the shape of those only a few strings loose,I put up Two new ones last week, $30. now Lee can repair them so I can rotate them, they will last longer. I also have a neighbor's that don't like me flying the flag, one is an old Korea war vet(Draftee) got shot up so has a bad taste in his mouth about the new war, bad mouths the Soldiers which we argue about. As Gen Hal Moore said "hate war, love the American warrior." Keep up the work.